These are the first two doll quilts finished. The first was made from some of my broken dishes blocks I have been accumulating from leftover half-square triangles from other projects. In this case, mostly the spool blocks I have put together for the group quilt. This little quilt is about 20.5" square. I started to add another border but it would have been too big. 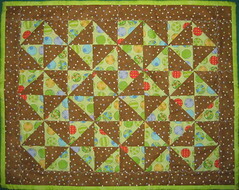 The second quilt is made from some leftover HST a friend gave me at my last quilt retreat. 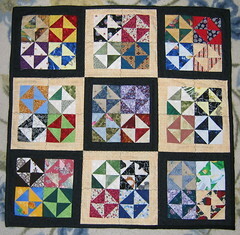 She was making a quilt for a grandchild that had flying geese blocks so she gave me the leftovers. She even gave me a few scraps of coordinating fabric so I was able to get a border around it. I had a great time at my daughter and son-in-law's home. The grandkids are so much fun. Little Clara's personality is really starting to develop and Layden was so happy to see me and the strawberries I brought along. He wanted to come home with me but he has swimming lessons to go to so it just doesn't work out right now. I think I have Papa convinced we need to go back over in another week or so for a visit so he can see the little ones also. It is a bonus that we get to see our son at the same time since he is living with his sister for the summer. Last Friday my daughter and I drove up to Coeur d' Alene with the kids for some shopping and to meet my sister and niece at the quilt show. It was a nice show and we got to see a couple of friends that are usually at our twice yearly quilt retreats. Clara had a good time wandering the quilt show and charming everyone she met. Layden's attitude improved once we bribed him with an ice cream cone after the show. At the show, my sister transferred two boxes of quilt magazines from her car to mine. She went through all her magazines and tore out things she was interested in and was giving them to Chelsea to go through also. That inspired me to come home and go through my magazines and take out what I am interested in. I am about halfway through and I have only saved about a one inch pile of patterns and pictures so far! The goal is to have two empty shelves in my closet so I can get at least some of the stuff up off the floor!